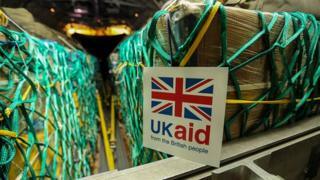 A bill to enshrine in law a commitment to spend 0.7% of national income on overseas aid has survived an attempt by some Conservative MPs to kill it off. MPs voted by 146 to six to allow the bill to proceed and the legislation was later passed by the House of Commons. Prime Minister David Cameron has said he backs the bill, yet to be agreed by the Lords, but that meeting the target is more important than passing a law. It comes amid claims the UK will have to spend £1bn more than first planned. The aid pledge was in both the Conservative and Liberal Democrat general election manifestos and was part of the 2010 coalition agreement. Lib Dem ex-cabinet minister Michael Moore's International Development (Official Development Assistance Target) Bill aims to make it a legal requirement. But critics, led by Tory MPs Philip Davies and Jacob Rees-Mogg, tabled a host of lengthy amendments on Friday intended to ensure the Commons ran out of time to debate and vote on the bill. Speaking during the two-and-a-half-hour debate, Conservative MP David Nuttall said the British people had "a long and proud history" of giving generously to charity but there was a risk that setting a target for the amount spent would make people think it was someone's else responsibility and that the "job was done". "We are trying to enshrine in statute one particular area of government spending that no other areas enjoy," he said. "It's better for the government to spend what they want of their own free will rather than being forced to do it." But MPs voted by an overwhelming margin to allow scrutiny of the bill to continue, and the legislation was later approved by MPs at third reading - the final stage in the House of Commons - by 146 votes to five. It will now move on to the House of Lords for further consideration and must be approved before the end of March to become law before the general election in May. Some ministers have questioned the value of enshrining the 0.7% pledge - which dates back to a United Nations aspiration in the 1970s - into law. Foreign Secretary Philip Hammond recently called it a "bizarre idea". But Mr Moore's bill was backed by a number of prominent Conservatives, including the International Development Secretary Justine Greening and her predecessor Andrew Mitchell. By passing the bill, Mr Moore said the government would honour its commitments, reassure recipients of aid and by "showing leadership internationally... press other rich countries to join us" in meeting the 0.7% target. Downing Street said that although Mr Cameron did not take part in Friday's vote in person, he supported the goals of the bill. "He thinks this is an important commitment. It is right that we help the poorest people in the world and it is right that we stick by the promises made to them to do it," a spokesman said. "He believes that there should be support for the bill and he is confident that it will probably go ahead." Earlier, The Financial Times reported calculations by the Office for Budget Responsibility that suggested an extra £1bn would have to be spent on aid this year and next, because of raised estimates for national income. Calculations of how well the UK economy has performed in the past were revised up this year after new methodology was used to determine total output. This meant spending on activities such as drugs and prostitution, as well as research and development, were included for the first time. This change has had implications for a range of UK budgetary commitments based on national income, such as contributions to the European Union and expenditure on overseas aid. Labour has long backed giving the 0.7% aid pledge a legal basis, arguing that this makes it less likely that future governments would abandon it. Shadow minister Gavin Shukor said suggestions that foreign aid was only backed by "a few middle-class, Guardian-reading, sandal-wearing, lentil-eating do-gooders with a misguided guilt complex" was incorrect. "On average, the British public believe we should not be giving 0.7%, but around 1.5% of our nation's wealth to help development," he told the Commons. But UKIP leader Nigel Farage told LBC Radio that foreign aid was an "arm of foreign policy" and the annual budget should be reduced by £9bn, with only "genuine" humanitarian schemes continuing to be funded.